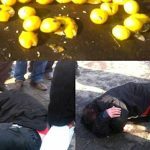 Iranian regime’s repressive forces, attack street vendors and destroy their only means of living. A video of a police assault on street vendors went viral this week, a scene which called to mind earlier incidences of brutality toward impoverished street vendors by authorities. 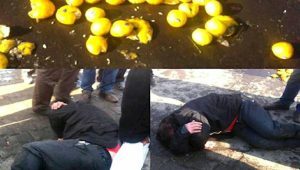 The video, taken on July 19th, shows municipal authorities and police in the city of Malayer attacking mentally and physically disabled street vendors. After ransacking their wares, the vendors were assaulted and then left on the streets. Videos taken of the attack went viral on Persian social media this week. The public responded with anger toward the regime. Public anger and calls for regime change have continued to mount since the mass uprising began last December, with the support of the MEK. Each additional outrage fans the flames of resistance as the regime continues to weaken. Even the regime’s state-run media has acknowledged the rapidly increasing theft and corruption within the regime. The economic situation in Iran is so dire that the regime’s media has been forced to acknowledge the severity of the issue of poverty in Iran. More than 90% of the population currently struggles with poverty in one way or another. The MEK has previously reported on water and electricity shortages, skyrocketing inflation, unpaid wages, and lack of economic opportunities, especially for women. Although officials are well aware of the economic conditions that cause street vendors to seek extra income to survive, they continue to send authorities to take measures against them, usually in a violent manner.